Here we have a nice German Grandfather/Floor clock. It was purchased at an antique store by the customer. Interesting story in that this customer found the clock and gave me a call for advise. He explained what the clock looked like. We discussed different features of the clock. With today's technology, he sent pictures of the clock. The clock looked like a keeper. From the pictures, it looked like all the parts were there (and they were). The chain was in pieces but repairable. The face is beautiful along with the weights and pendulum. The clock was purchased for a great price and delivered directly to my shop where I took a closer look. The notes from the previous owner stated this is from the 1920's. I believe the movement is much older than that. Given how the movement was held together, i.e. taper pins holding the movement together I believe this movement was made in the 1860's. In for repair is a Seth Thomas mantle clock. 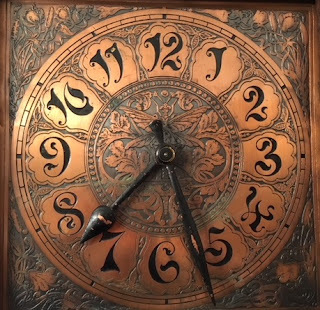 This clock was in storage for a number of years and finally got discovered in Nebraska. It was brought to me for repair. At first look, it seemed in pretty good condition. I could tell it has not been running in a long time. This movement is similar to many Seth Thomas movements that strike the hour and half hour. Most movements made by this manufacture are of the bim-bam type. This movement just lifts two hammers and drops them when required.